START TIME: Never start an evening dance before 8-00 p.m.
LEAD BY EXAMPLE: Organisers, bride/groom will encourage so many extra dancers on to the floor early if they,themselves, join in from the very start,even if they have never danced before! Also,encourage known 'ring leaders/characters' (bald Uncle Charlie,famous flag-pole painter,you know the sort) to join in as early as possible. You see,the earliest dances are the easiest - but it is also the time when people are most inhibited and need to see others enjoying it and getting the dances 'wrong'. These dances can set the atmosphere for the rest of the evening. MAKING MISTAKES: Never worry about making mistakes during dances ! Just laugh it off,it's all part of the fun and your laughter will rub off on others.People watching will not want to dance if those already dancing look miserable or harrassed. Personally, I never call for 'proper folk dancers' on principle since many of them seem more interested in showing everyone present how clever they and their fancy footwork are. Our agency may be a business,but our business is in encouraging fun and relaxation. Above all, enjoy yourselves! BOOZE AND BOOZERS! : If alcoholic drinks are available, encourage people to drink early on and then slow down.Dancing will also help 'sweat' out alcohol. Early drinks loosen inhibitions,tongues and feet. Please be clear about this; we are not advocating irresponsible drinking sessions! And if someone is too drunk,leave them sat down, they become a liability to themselves and others on the dance floor. FOOD BREAKS/INTERVALS: If food is to be offered,set aside a definite interval and inform your caller as soon as possible of your plans or schedule (especially if hot food is involved !). NEVER, ever have an 'eat-when-you-like' running buffet - it kills the dancing stone dead ! LIGHTING: Keep lighting fairly subdued (ish !). Not glaring bright to put people off standing up in the first place. Definitely not dark with flashing lights (it's not a disco) or people cannot see too well when trying out the dance moves. Consult your band and caller before you get started. SETTING UP TIME: Bands usually need at least an hour to unload, set up equipment and carry out 'sound checks' - we are talking 'live' music here ! So if you start at 8-00 p.m. make sure the room is available to the band at 7-00 p.m. latest. Likewise,make sure the caller knows definite details as to when to end the night (licensing laws,'grumpy' caretakers). It might save somebody some embarrassment later on. STAGE/SITE: If your room has a stage for the band,that is ideal. If no stage is available,don't worry - it's not a problem. Preferably site the band at the end of the room furthest from the main entrance/exit, in a space 15' x 15' approx with a safe, tested power point within reasonable distance. 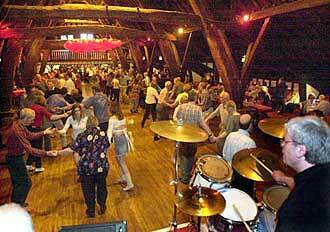 CHILDREN: We love to see them at barn dances - no inhibitions,showing up the adults.But,above all, discourage young children from touching or playing with band gear. Not only are modern instruments very costly to buy and maintain but nearly all instruments and P.A. systems will be ELECTRICALLY WIRED - Need we say more ? Everybody's safety is a paramount concern and needless accidents can mar your special event ! This is not a definitive list of 'Do's and Don'ts'. They are tips which I have learnt since becoming a caller in 1980. On the night you will probably have forgotten most of this - don't worry ! Your band and caller will advise you ! FINALLY,only offer the band and caller free drinks for the duration if you have recently won the National Lottery - it might end up costing you more than your total 'all-in' charge !!! But the gesture will be enormously appreciated ! !